Full details of West Ham's "secret" deal as tenants of the Olympic Stadium should be made public, says former Leyton Orient chairman Barry Hearn. The cost of transforming the venue into a stadium ready for football has reached £272m. West Ham will contribute £15m but the rent they will pay - reported to be £2m a year - has not been made public. "Who is it confidential from? I can't see any reason whatsoever why it should be secret," Hearn told BBC Sport. Hearn, chairman of Orient for nearly 20 years until selling up in 2014, wanted the club to groundshare the Olympic Stadium with West Ham and lost a legal battle to have the bidding process overturned. "The actual deal West Ham has got is still confidential and our current mayor of London is refusing to reveal details," he said. "As a taxpayer, I find that quite confusing. When people spend my money, I rather like to know what it's been spent on. "In the absence of that information we can only speculate that it is a deal so beneficial to West Ham that it becomes questionable in its own right." It is thought details of the deal remain confidential because much of it is regarded as commercially sensitive information. West Ham, who finished 12th in the Premier League last season, are preparing for their last campaign at the Boleyn Ground before moving across East London to the Olympic Stadium in time for the 2016-17 season. The Stratford venue, built for the London Olympics in 2012, was not constructed with football in mind and the conversion costs will take the overall spend on the venue above £700m. West Ham have a 99-year deal as anchor tenants, and the London Legacy Development Corporation (LLDC) says future profits will see a return to the taxpayer. When asked to comment, the Mayor of London Boris Johnson's office reissued a statement from the mayor which did not address the issue of transparency. "Our remedy offered long-term sustainable investment in order to protect an iconic stadium that Londoners took to their hearts, and which is now set to be home to almost every conceivable sport, concert or community event for decades to come," said Johnson. "We've created a knockout venue that will drive and sustain thousands of jobs, where we've ensured that a hefty share of the profits will be paid back into the taxpayer's coffers and which provides a genuine Olympic legacy for our city." Hearn, who is also the chairman of World Snooker and the Professional Darts Corporation, said mistakes were made at the beginning of the stadium planning process. "They were trying to do something on the cheap and it has backfired at a huge cost to the current taxpayer," he said. 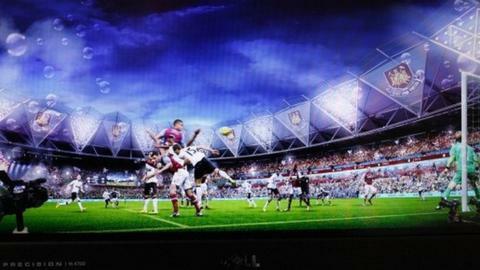 "It will still be an attractive stadium and will do a fabulous job for West Ham. What a postal address to have - the Olympic Stadium. It doesn't get better than that. "West Ham, with the Olympic Stadium, in my view will become one of the major clubs in Europe within four or five years." But while the Hammers will have a new home, Hearn fears for the future of Orient, who are just over two miles away from the Olympic Stadium and are now in League Two following relegation. "It doesn't take a genius to say this could have a decimating effect on Leyton Orient," added Hearn. "It's a shameful situation that the powers-that-be have not taken this into account. When they use the word legacy, they should get a dictionary and see exactly what it means."